Looking at Painting the fence this weekend, not a bad buy by the looks of it with 30% off. Loads of offers with the good weather coming! Bought this, three tubs for delivery. Came packed as one and a two. The two pack was leaking and a write off. 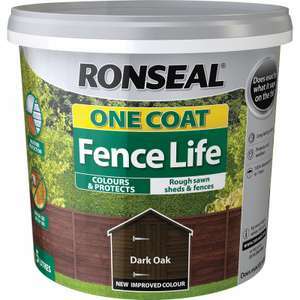 I had 17 new fence panels installed and was using Ronseal One Coat to start. I noticed it was watery, but kept brushing it on the first 10 panels. Rain came about a week later and I noticed it didn't repel the water, but allowed it to be drawn into the wood. I decided then to coat the remaining 7 panels with Ducksback. The first rain on these panels, the water was repelled. That remains the case 2 years later, as good as when I first painted them, yet 6 months after the Ronseal was applied, the paint was pealing off. First deal so I hope I've got this right? In the market for a cheap and cheerful angle grinder and came across this one. Aye, Probably why instructions on how to use it properly are included but then again not everybody bothers to read them either. It's making first time users aware that they need to hold tight I suppose. Then again if you go out buying power tools you should really know better than to hold them with the grip of a sleepy child. I do use a blade for wood cutting, it's just not designed for use with an angle grinder. Essentially it is made for grinders but you would never be able buy it off the shelf because of the RPM grinders run at. Grinders are not designed for wood blades. Basically I'm too cheap to buy a plunge saw because I only open up a floor board every couple of years. What do you use a blade made of wood for cutting? Just picked up a set, very nice indeed.have some heat..
Yeah when I looked into these there are many copies made it seems and they all look nearly identical...but some are worse than others going by reviews. My CK ones seem OK, handy to have if you strip wires and want a neat job done. There are reviews on YouTube showing there are subtle differences between them. Looks like they're licensed by someone and loads of different people make them. You can buy the same pair rebranded in almost any tool shop. I bought the Aldi one a while back, cost a tenner and is in a case with a load of crimpy things. 3 year guarantee too. Lidl also occasionally have these on offer in store. I can't remember the exact price, but they must have been cheap because I bought some! The metal cap on the end of the grip falls off eventually with these chisels. Just a heads up. I have been tempted to pick up a cheap set of chisels, less than a tenner on ebay. However, this is a great deal from a reputable brand. I am sure this will last for years with proper care. Took the plunge and brought a set. Great thing about toolstation is they take paypal. Heat. As I feared, these are probably a bit rubbish. But they are cheap. Ah well, I should get another 50 years out of mine and they'll still be some use left for my grandkids if I have any by then. Even the £80 set of clear yellow handle marples are cheap Chinese steel . They don’t use Sheffield steel no more . That stopped over 25 years ago . I have a set of clear yellow handle Stanley’s I bought when I was 16 !!! 24 years ago . £120 for a set of 7 chisels . That was 3 weeks apprentice money . Still going strong now . It works with spay well? Anybody able to recommend paint for an outdoor concrete wall that lasts? Have an area round our patio but the last stuff we used only lasted a year. This set is good for light duty applications. Quite a few unusual bits in there. I’d never use them as my primary set but they are handy to use for using with a screwdriver rather than a power drill. I have this set. hotukdeals.com/deals/stanley-fatmax-cordless-18v-2ah-li-ion-brushed-combi-drill-2-batteries-fmc626d2k-bqgb-60-3188906 B&amp;Q near me last weekend had loads of these in store ( Trafford park ) I’m reasonably confident they’ll have stock near you ? Or if you don’t need the drill part then best to get an impact driver... https://www.wickes.co.uk/Einhell-Power-X-Change-18V-3Ah-Battery-and-Fast-Charger-Starter-Kit/p/207911 https://www.homebase.co.uk/ozito-power-x-change-18v-cordless-impact-driver-skin_p389358 Bit of messing about I suppose shopping at 2 places but assuming you’ve not got cordless brand tools already the power x change is a good option as you can get different tools ( einhell &amp; ozito (red) ) pretty cheap and the batteries are fully interchangeable. Hope this helps. I have this set. Its a nice set in a sturdy case. I think I paid less than £18 for it but still, a good deal. This is the one that just broke on me, lasted about a year with a lot of use. Will try the Cox one this time. Ordered thanks, mine just broke on me yesterday. I must admit I have never had that problem my Nilfisk is over 5 years old and still works like new. But I found that the hoses and lances fail quickly with nilfisk. 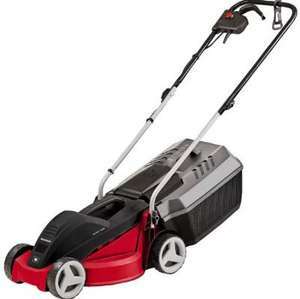 What do you need to look at for a decent machine with quality long lasting hoses and lances? Don't buy cheap Karcher's with plastic pump housings buy a Nilfisk with a cast metal housing they will last 5 times as long as the cheapo Karcher's. Hello OP. This deal is for the Compact K2 and the amazon one is for K2 Full Control Home. The main difference between both is the Compact has a Standard Quick Connect Gun and the Full Control model has G120Q High-pressure gun &amp; Click Vario lance. Watch out for chuck wobble on these, it is shockingly common and more often than not warranty doesn't cover it as it's considered to be " within tolerances". It's £150 on their site? Hate combis and forstner bits. Just collected this morning. Easy to put together, although as per other comments, quite difficult to judge the oil level. I found it took around 2/3 of a litre. Seems a very solid machine. Took a few attempts to start first time, but have started around 20 times now first time. Depending on how many times you use it during the summer. I buy 5 L of fuel and a bottle of oil every summer and they are enough for me. My garden is around 15 meter. How long does the 4 stroke oil last? Require constant topping up? Fuel go a long way? 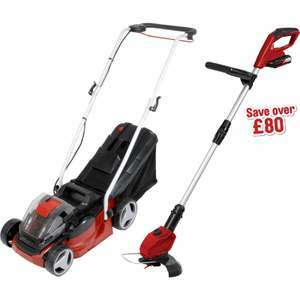 1.3 litres (capacity), would this do a an average size garden (70ft)? Based in Bridgwater, Somerset, Toolstation has risen incredibly quickly to become one of Europe’s biggest tool retailers. The company was founded as recently as 2003 by Mark Goddard-Watts (who had earlier created Screwfix). After a major investment by Travis Perkins in 2008, the company expanded quickly, opening more than 250 outlets by 2016. Toolstation products can either be purchased in-store or online at www.toolstation.com. If you’d like to visit a Toolstation branch in person, use their Store Locator tool to find your closest location. Alternatively, log onto Toolstation.co.uk and make a purchase online. Automotive – Including jacks, winches, mechanics tools, suction pads, wrenches, fuel pumps, cans and oils. Cleaning & Pest Control – Featuring indoor and outdoor surface cleaners, pesticides, litter disposal products, mops, brushes, wipes an hand cleaners. Construction – Features insulation, metalworking materials, damp proofing, mortars, admixtures, PVA, flooring materials and fascia. Electrical – Features consumer units, cables, extension leads, sockets, batteries and fans. Hand Tools – Includes saws, knives, wrecking bars, hammers, screwdrivers, tape measures, levels, plumbing tools, spanners & wrenches, roofing tools, cutters, chisels and files. Heating – Includes a range of radiator types, pumps, flues and valves. Ironmongery – Includes door furniture, locks, latches, door closures, TV brackets, letter boxes, draught excluders and knobs. Ladders and Storage – Includes extension, combination, step, loft and access ladders, as well as tool bags, tool boxes and shelving. Landscaping – Includes chainsaws, blowers, shredders, mowers, rakes, shovels, tillers, hoses, hose reels, paving materials, borders, grass seed and fences. Lighting – Includes LED downlights, spotlights, outdoor lights, lamps, torches, emergency lights and site lights. Painting and Decorating – Features paints, primers, plaster, brushes, palettes, rollers, wallpaper, putty and dustsheets. Plumbing – Features piping, toilet fittings, valves and connectors, macerators, pump clips and pumps. 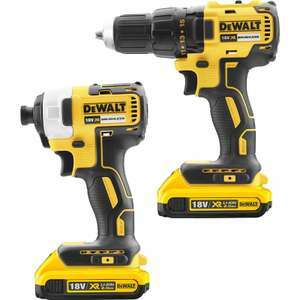 Power tools – Including drills, impact drivers, multi-tools, corded and cordless models, jigsaws, power sanders, nailers and grinders. Power tool accessories – Includes drill bits, screwdriver bits, saw blades and discs. Roofing and Drainage – Includes roofing materials, guttering, piping and waterseals. Security – Features alarms, locks, lights, door chimes, safes and chains. Screws and Fixings – Includes brass and steel screws, anchors, wall plugs, nuts, washers, rivets and nails. Taps & Showers – Features kitchen and bathroom taps, shower heads, shower trays and curtains, pumps, bathroom accessories and shower hoses. Workwear & Safety – Includes overalls, PPE, coats, hi-vis clothing, boots, shoes, face masks, respirators and fire control equipment. Toolstation are always running promotional sales. The best place to look for the most recent offers is their HotUKDeals listings, but you might also want to bookmark the Toolstation clearance section, which always has a large selection. Pick the right time of year to shop with Toolstation as well. The company regularly runs power tool discounts around Black Friday and the January Sales, while there may also seasonal sales. For example, as winter approaches, outdoor equipment may be reduced in price, so keep an eye out for bargains. Toolstation also release a print catalogue on a regular basis, so if you often buy tools or supplies, it may be worth ordering one. Just add items to your online trolley as required, then head to the checkout. At the payment pages, you can check to see which stores have your tools in stock, and easily add items from the Toolstation catalogue. All users have to sign up with Toolstation, which should only take a couple of minutes. Customers ordering online from Toolstation can use the following payment methods: VISA, Mastercard, American Express and PayPal. The company also operates a “secure shopping” system, ensuring that customers’ details are protected at all times. Toolstation offers three delivery options. Standard delivery (and delivery to any remote areas) takes 2-4 days and costs £5 for orders below £10. Above that it’s free. Express delivery will get your items to you by 18:00 the next day at a cost of £5 (free above £10). Turbo delivery arrives by 12 noon the next day and costs £10 (£5 on orders above £10). Alternatively, you can choose to Click and Collect at any Toolstation outlet. Any item purchased from Toolstation can be returned within 30 days of receipt. To do so, take your item(s) to a Toolstation branch or contact their Customer Service Team at: 0808 1007211. Have your order number handy when you talk to a staff member. They will lead you through the returns process. Another useful tool is the Toolstation app, which allows you to browse the company’s product range, make purchases, contact Customer Service, find branches and check stock availability. There’s also a very clear, useful FAQ section on the Toolstation website, which should clear up most basic questions. There’s no better place to find saws, hammers, cordless drills, gardening tools, screws, nails and locks than Toolstation. Whether you are a skilled professional or a keen DIY fan, check out the Toolstation HotUKDeals listings and save money on your tools, materials and accessories.